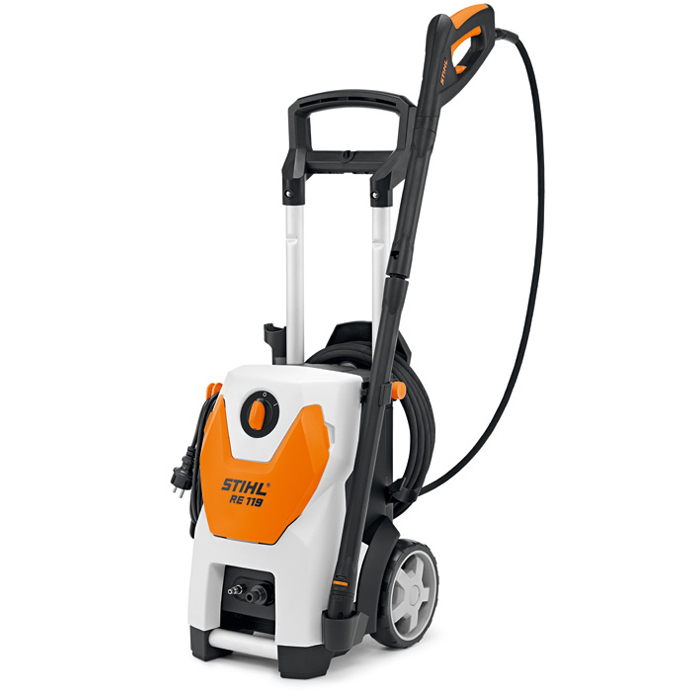 Compact cold water high pressure cleaner with 125 bar operating pressure. Fitted with trolley and telescopic handle for easy transport and storage. Hose and swivel power cable holders, rotary and fan jet nozzles and a detergent spray set all come as standard, with practical integrated nozzle storage too. With steel-reinforced 8m high pressure hose. Maximum water throughput 500 l/h. Aluminium pump head - Constructed from aluminium, the high pressure pump with stainless steel pistons is particularly resilient and durable. Aluminium telescopic handle - The high quality, extendable telescopic handle makes transporting the pressure washer more comfortable and makes for more compact storage. Foldable front cover with nozzle storage - The fold out front cover reveals a convenient storage area for both the fan and rotary nozzles. Situated at the front of the washer, the nozzles are easy to access at all times. Aluminium carrying handle - The sturdy aluminium handle on the housing allows for easy lifting, carrying and loading of the high pressure cleaner. Steel reinforced high pressure hose - The high pressure hose is reinforced with steel making it very durable and longer lasting. Quick release coupling at high pressure output - Quick and easy attachment of the high pressure hose greatly reduces setup times. Anti-drill and quick release coupling - The anti-drill and quick release coupling prevents tangling of the high pressure hose, making it possible to use its full length. Rotary nozzle - The rotor nozzle provides concentrated cleaning power with large area output. It has a powerful pencil jet in a rapidly rotating motion. Fan-jet nozzle, variable pressure - With the variable pressure fan jet nozzle, larger areas are cleaned quickly and effectively, with control over the pressure to suit different tasks. Accessory holder - To ensure that no accessories are lost, the cleaners are equipped with practical holders for storing the wash brushes, detergent bottle and high pressure hose. Induction motor - The high quality induction motor offers superb performance with low noise and long service life. Large wheel diameter - The large wheel diameter makes transporting the washer on and off road much smoother.